Tangy twist to the old fashion spinach salad. If you like and have the time, make the dressing in the morning. The longer it sits, the better it is. Wash your spinach ahead of time. Makes for easy preparation later. You can also do the grilling early. That way, all you have to do is mix it all before serving. 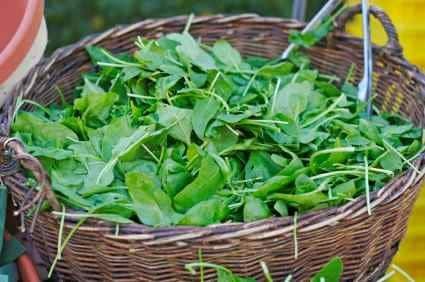 Spinach salad is a filling entree choice that can be customized with your favorite ingredients. Wash all vegetables well. Peel and slice eggplant, then put into a drainer and salt. Let sit until most of the liquid has come out. Grill pepper, asparagus, and eggplant. After grilling pepper, put into an airtight container. Just set the other veggies aside. After 20 minutes, peel the pepper. Slice asparagus into 1-inch pieces and slice eggplant into strips. Right before serving, mix all veggies together, including sundried tomatoes (sliced) and whole pickled garlic. For dressing, pour in olive oil (about 1/4 cup to ½ cup (depending on how big your salad is)), white balsamic vinegar (about half the amount of the olive oil), garlic clove, grated peel from lemon, juice from lemon and 2 tsp of sugar. Shake like crazy. Then dress your salad right before serving. It is some work, but well worth it.